Learn about Lake of the Ozarks by reading Lake of the Ozarks—Dam Good Outdoors by Charlie Spence, Aviation Writer. It features a mini, but thorough tour of the destination, plus all you'll need to know to plan your trip including getting there, objective information on places to stay and eat, and things to do. At the end of the article, we've provided a summary of the contact information for your easy reference. Enjoy! An aerial view of Bagnell Dam. If you enjoy outdoor activities and are fascinated by the wonders of nature, there is no off season to visit the Lake of the Ozarks in Missouri. In order to build a dam for a hydroelectric power plant, this man-made reservoir was created by impounding the northern part of the Osage River. Three smaller tributaries – the Niangua River, Grandglaize Creek, and Gravois Creek – were included in the impoundment. The lake covers more than 55,000 acres with a shoreline that exceeds 1,000 miles. Although constructed to provide a means of generating power, the lake drew many full time residents and became a major tourist attraction. The entire area offers a unique variety of attractions. Your fun can be in the water, on the water, or under the water. It can be on the earth or under the earth. One of the places to begin your visit is at Osage Beach. This man-made sand beach on the banks of the Osage River, is located in Lake of the Ozarks State Park, which is the largest state park in Missouri. It is one of two public beaches. Here you can sun, swim, or snooze. Much of the lake’s shoreline is privately owned, providing residents direct access for their own swimming and boating enjoyment, but there is still plenty of room for visitors. If boating is your pleasure, more than two dozen boat rental places make it easy to select the boat of your choice. Enjoy water skiing, tubing, scuba diving, parasailing, or exploring the many coves and the wide expanses of this lake that stretches 92 miles from end to end. Seasoned boaters will know the laws and safety measures, but it’s wise to check the boating laws of Missouri before you venture out. Maybe relaxing and sightseeing is your cup of tea. If so, take a cruise. Get aboard the old paddlewheel riverboat Tom Sawyer for an hour cruise. Various cruises offer different boats and different events. Select a breakfast, lunch, or dinner time to go along and have the fascinating facts and interesting places explained by your guide while you munch. Perhaps what is under the water is your goal. Grab a rod and reel and get ready for some excellent fishing. The fishing season is all year long. What you catch depends on the season. Knowledgeable anglers in the spring use deep diving crankshafts and jig-n-frog lures. As the water warms in spring and the bass spawn and surface, plastic worms and lures attract them to give the rod holder rewarding strikes. You will find white bass, black bass and hybrid stripers. Okay, so you’re a land lubber. Golfers will find eleven courses; some 18-hole courses to challenge and some nine hole ones to provide a shorter, less strenuous time. Two state parks cover much of the area with facilities to make a visit enjoyable. More than 2,400 acres are included in Ha Ha Tonka State Park where you can enjoy horseback riding, and hiking many trails. Cyclists find a variety of trails for any type of cycling but cyclists must bring their own bikes. 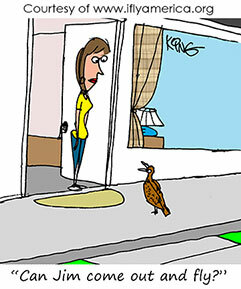 Maybe just relaxing and bird watching is your idea of a great outdoor sport. If so, the water environment attracts a number of species to this feeding and resting ground. You might spot the great blue heron, hawks, ducks, wild turkeys, sandpipers, ruby-throated hummingbirds, meadowlarks, eagles or many other species. What you might spot depends on the time of year you visit. As interesting as the water and land areas might be, there is another place for adventurers to discover—below ground. Centuries ago Osage Indians discovered what lies beneath Thunder Mountain. Local legends say Indian wedding ceremonies were held in the cave and today this cavern is called Bridal Cave where nearly 3,000 couples from around the world have exchanged wedding vows. The chapel can be reserved if a wedding is in your travel plans. It wasn’t until 1948 that this cavern was officially protected. After several years of added exploration many new chambers of outstanding beauty were discovered, including the crystal-clear waters of “Mystery Lake.” Guided tours last approximately one hour and you will be led through room after room of mineral deposits, giant columns, and the impressive beauty resulting from centuries of struggle between water and rock. The tours are over concrete walkways for your safety and comfort, and this just one of the several caves in the area. All your time doesn’t have to be spent in open spaces. Four wineries are in the area with each offering a different attraction. For instance, tour the vineyards of one, dine and sample the wines at another. Nearby is a casino with more than 900 slots, 27 tables and a live poker table. A number of the area hotels and restaurants also have live entertainment in the evenings. If you have the time and room to take items home, one of Missouri’s leading retail centers is within 50 miles with more than 110 stores. Among these are art centers, antiques, clothing and a myriad of other shops. To get around you will need a car, and if you rent one it is wise to make reservations in advance. 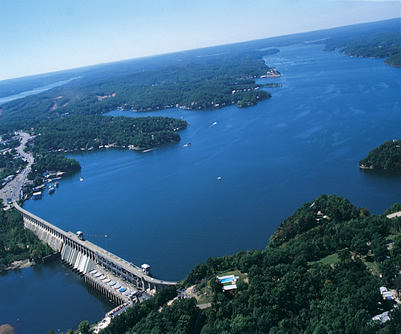 Lake of the Ozarks is the largest man-made, non-flood controlled lake in the United States. At the time it was created, it was the largest man-made lake in the world. Although started in 1912, construction of the Bagnell Dam didn’t get under way until 1929. Now, in addition to an interesting and entertaining place to visit, the area has more than 70,000 homes. The lake is so large that several towns are in the area so it is wise to decide what you want to see and do and then get help about where to stay. To learn more about this fascinating area you can check the web site www.funlake.com. Here you can find additional photos and information. Thanks to this website and the people at the chambers and travel offices in the area for some information. Several good airports are around the Lake of the Ozarks, both paved and grass. One you will probably want to check is Grand Glaize, (K15) right at Osage Beach. It has car rentals, many hotels are nearby and it has full service. Area pilot groups having the Lake as a meeting place usually select the Grand Glaize. Lake of the Ozarks is a popular tourist spot and there is a variety of excellent accommodations, hotels, motels, bed and breakfasts, condos, houses and even houseboats. There are eight B&Bs, for instance. More than 7,700 units are available, ranging from bare accommodations to plush resorts. Some are right at the water’s edge, others next to a golf course. Make your reservations through the IFA Online Travel Booking Service at www.iflyamerica.org/travelservices.asp before you go. Snacking, eating, and dining are all available here. Some places have entertainment and dancing, many on only certain nights, and some are closed during winter months. There are enough places that you will never go hungry. You can chose from the full range of a quick snack, up to fine dining. Notice: This information is current as of October 2008. It is recommended that you contact the numbers, and/or visit the websites above to determine any changes to the information.